He wears penny loafers and argyle socks from J Press. On his back he wears a striped purple button-down underneath a double-breasted jacket, both Brooks Brothers. On his face, a Cheshire smile framed by Dean Acheson’s mustache and Cardinal Richelieu’s beard. On his head, a yarmulke and heavy-duty ear protectors. In his right hand he holds a Smith & Wesson pistol. He raises his right arm, revealing the tzit-tzit—the tassels on a Jewish prayer shawl—beneath his jacket. He places the sights directly on the line connecting his eye to the bull’s eye. There’s a bang, a flash, and smoke. The target twitches. When it stops moving, we see a small hole through the eight-point circle, two centimeters away from the bulls-eye. Trevor Hines, DC ’10, is an Orthodox Jew, an aesthete, and a pistol ace. He rolls the paper target back to the firing line; takes it off the clip; and looks at it closely. All 10 rounds are in the black, with a bit of a cluster just left and high of the bulls-eye. “I’ve done better,” he promises me, and starts to fiddle with the sights. From the article, I am guessing he was shooting a S&W Model 41, a very popular pistol for Bullseye competition. This entry was posted in Trevor Hines on April 24, 2010 by jMark74. Sloane Milstein is not your typical athlete with Olympic aspirations. At 29, the Northeast native would like to represent her country in the air pistol event at the 2004 summer games in Greece, the site of the first modern Olympiad. However, as the Temple University alumnae points out, she’s in no hurry to secure her place on the national team. “Whether or not I make it to 2004, I think it puts me in a great position for (qualifying in) 2008 because of the all the experience I’m gaining at this point,” she said. Milstein finished 12th in the international style air pistol event at last week’s USA Shooting National Championships in Georgia. She’s been competing actively in the event for six months. “I’m completely happy with that (finish),” Milstein said. “I’m certainly moving in the right direction to meet my goal.” A strong showing at last week’s competition would not have solidified her position on the U.S. national team. To qualify for the 2004 Games in Athens, she’ll need a successful showing in the air pistol events at the upcoming Olympic trials in September. All qualifying meets will be held at Fort Benning in Columbus, Ga. Combined scores from this fall’s trials, as well as the totals from next April’s trials, determine who will represent the United States in Greece next summer. Milstein scored a 350 out of a possible 400 points at the two-day event, finishing slightly lower than the 360 average she’s been scoring since beginning her Olympic quest in December. “That’s what we need to see, a steady improvement,” Milstein said. “It was more important for me to work on some training techniques than it was for me to go after the highest score I can possibly get.” Milstein discovered a knack for handling air pistols while training for the modern pentathlon, a five-sport event that has athletes participate in running, swimming, shooting, fencing and horseback riding. The articles are old and I couldn’t find any updates about her Olympic pursuits. This entry was posted in Sloane Milstein on April 24, 2010 by jMark74. I use Google searches to find interesting information about Jews involved in shooting sports. This time Google served up a gem. The winner of the 1936 Bisley high school rifle championship was a 15 year old named Aubrey Milstein. Of course, Aubrey was Jewish! So what is Bisley, and who was Aubrey Milstein? In 1890, the village became the location for the UK’s National Rifle Association Championships which moved there from Wimbledon. The competition is hosted by the NRA on its Bisley ranges – land owned by the Ministry of Defence. Bisley hosted most of the shooting events in the 1908 Olympic Games, and all the shooting for the 2002 Commonwealth Games. During the 2012 Olympic Games the shooting will be held at the Royal Artillery Barracks, Woolwich. One notable member of Bisley’s club was society doctor and suspected serial killer John Bodkin Adams, one time president of the Clay Pigeon Shooting Association. Colt, the US firearms manufacturer, sold since 1894 the Bisley Model equipped with English styled target grips and shot low pressure ammunition. It is also the location of The Operational Shooting Competition, in which members of the British army compete for the coveted Queen’s Medal for Shooting Excellence. I get the impression the Bisley range is similar to Camp Perry in the US, where every year multiple precision shooting sports have their national matches. Young Aubrey was a bit of a ruffian – but he refined his combat skills. Not yet 16, a keen member of his Grammar School’s rifle club, he was chosen to represent the school at Bisley, the home of rifle shooting. The finals were on a Saturday – Shabbat, the Sabbath – but still Aubrey had no hesitation in traveling to Bisley – or to shooting on Shabbat , and came away with both the individual title and the school’s title! The story of Aubrey Milstein’s life is a fascinating read. It is a story filled with Tikun Olam. Aubrey served in both the British Army to fight Hitler, and then fought for and helped build the State of Israel. Later he returned to England, and became involved in a number of charities and inter-faith organizations, and active in the fight against racism and discrimination against all groups, not just Jews. By all impressions, he was a leader in his community. This summary just scratches the surface of his life, the entire eulogy can be read at this link (I downloaded a copy, drop me a line if you can’t open the link). An inspiring story worth reading. This entry was posted in Aubrey Milstein on April 16, 2010 by jMark74. I guess somehow I missed the fact that there was a Jewish competitor in the Vancouver Olympics…and a shooter! To date, an American has never won a medal in the biathlon, which was originally developed in Norway as a training exercise for the military. It became an Olympic sport in 1960 and was opened to women in 1992. At 22, Laura Spector is the youngest member of the U.S. team and also one of the shortest. Spector placed 77th in the 7.5km sprint on February 13, and 65th in the 15km individual on February 18. (You can read more about her experience at her blog.) She did not expect to medal in her first Olympics; she has her sights set on the 2014 games in Sochi, Russia. In addition to her athletic training, Spector studies biological sciences, genetics and Jewish studies at Dartmouth College and is on track to graduate this year. Mazal Tov to her and we’ll be watching for 2014! I’ll add the link to her blog on my links, hopefully she’ll keep us all updated. This entry was posted in Laura Spector on April 12, 2010 by jMark74. I started this blog primarily to discuss Jews in the precision shooting sports. Precision shooting is an excellent activity for developing patience, discipline, and persistence. It is the kind of competitive activity where, really, you compete against yourself. However, it is important to remember that precision shooting is a martial art. Most American Jews (and nowadays many Americans) have no appreciation for the role that precision shooting skills play on the battlefield. Further, they have no appreciation for the time and effort it takes to accumulate that knowledge and skill. 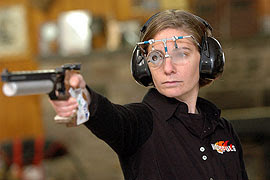 Sure, Jews in America who participate in precision shooting sports are having fun. But whether they know it or not, they’re building up a storehouse of knowledge, experience and skill that can be passed down from generation to generation. Our history has shown us that no matter where we’ve lived, sooner or later we’ve had to fight. This week there was an excellent post on a New York Times blog that analyzes the reasons for the poor marksmanship skills of many of the Taliban. It’s a long article, but worth reading to begin to get an appreciation for all the work and knowledge that goes into a well-placed shot. Update: Part II of that series. This entry was posted in Uncategorized on April 4, 2010 by jMark74.